The preliminary events at the 1989 World Series of Poker featured wins by two men who would both be influential in creating the WSOP’s first major competitor a decade and a half later, the World Poker Tour. The money man behind the scenes of the WPT, Lyle Berman, won a bracelet in the $1,500 Omaha event and WPT Commentator (but poker player first) Mike Sexton, won a bracelet in the $1,500 seven-card stud eight-or-better event. Also picking up bracelets in the preliminary events that year were Bob Stupak ($5,000 deuce-to-seven lowball) and Mel Judah ($1,500 seven-card stud). While all of the stories in the preliminary event that year were nice, they paled in comparison to the main story in the main event. Johnny Chan was the first player to attempt a three-peat world championship run since Stu Ungar earlier in the decade, and Chan almost ended that title run very early. He recovered from his initial woes on the first day with some truly gutsy play and once again he charged into the final table with a ton of chips at his disposal. The three final-table contestants that year who did make the television final table included George Hardie, Mike Picow, and Fernando Fisdel. Of the final six players, Steve Lott held a slight chip lead over Chan in the final six, which also included Noel Furlong, Berman, Don Zewin, and a young, boisterous 24-year-old named Phil Hellmuth. Furlong was the first to go on the very first hand of play between these final contenders. He shoved all in on a flop of K 10 2 with pocket fours and Chan called him down with pocket queens. The turn and river brought no help to Furlong and he was sent back home to Ireland in sixth place. Berman followed Furlong out of the tournament very soon thereafter, when Chan covered him all in with a set of sevens against a pair of kings and an an ace kicker. Chan had knocked out yet another opponent and it looked like he would cruise to a third world championship. Chan saw his momentum crushed when he attempted to eliminate Zewin next while holding pocket nines. Zewin held A-J on the hand and an ace on the river doubled him up. No one was happier about the outcome of the hand than Hellmuth, who bragged that he had mucked pocket tens when action heated up in the pot. Things only got better for Hellmuth when he had both Zewin and Lott covered all in a few hands later with A-10 in the hole. Lott held pocket twos, while Zewin held two tens. Both were eliminated though, when Hellmuth spiked an ace on the flop to win the hand and bring about a finale between himself and the defending champion. The huge double-eliminated hand gave Hellmuth a large lead heading into heads-up play, and the chip stacks stood at Hellmuth: 1.1 million, Chan: 600,000, when the storm of the final hand began to gather. 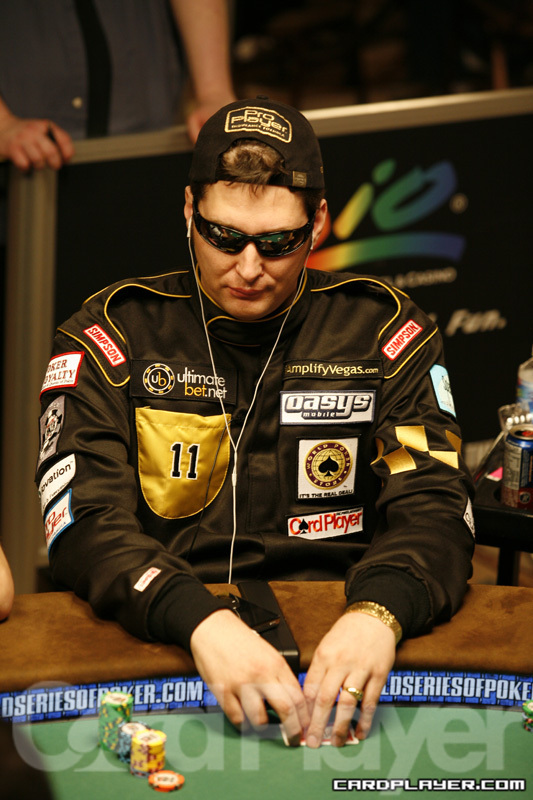 Hellmuth opened the action with a small raise and Chan reraised to 130,000. Hellmuth then moved all in and after a few minutes of deliberation Chan made the call. Hellmuth held pocket nines and Chan flipped over A 7 . The board was dealt K K 10 Q 6 . The world’s self-proclaimed best poker player in the world now had some accolades to back it up with a world championship in tow. He stopped Chan’s run at a third title and became the youngest world champion winner ever, a record that still stands. Um there is an error in this article..